NORMAN, Okla. – Oklahoma quarterback Trevor Knight said the goal was simple. The offense had to come out to a fast start. Mission accomplished. Following all the off the field distractions and all the preseason hype, it was back to work for OU in a solid 48-16 victory against visiting Louisiana Tech on Saturday night. It’s too early to say all of OU’s questions were answered in one game against an overmatched opponent, but you could see the relief on everybody’s face with the focus being on what’s on the field instead of all the things happening away from Owen Field. Linebacker has been one of the biggest storylines in the last few weeks. With the unusual situation surrounding Frank Shannon, depth is a question. Shannon’s attorney said Friday that Shannon is being voluntarily held out by the university as his legal situation continues. Shannon was dressed, but as expected, did not play. He was suspended by the university for one year two months ago. That lack of depth became an even bigger question Saturday when Jordan Evanswas ejected for targeting in the first half, leaving Caleb Gastelum to step up and show what he can do. Gastelum, to his credit, finished with three tackles and nearly had an interception on his first play in the game. The offseason issues weren’t just on defense, though. OU fans got a look at what could have been in warmups as wide receiver Dorial Green-Beckham and quarterback Baker Mayfield were out with the team but not suited up. Green-Beckham, who transferred from Missouri this summer, is not eligible this season, while OU is still awaiting word on what’s going to happen regarding Mayfield. A former walk-on at Texas Tech, Mayfield joined the Sooners program following last season but nothing has been decided on his eligibility. All the issues, but after the first quarter, the message was sent. 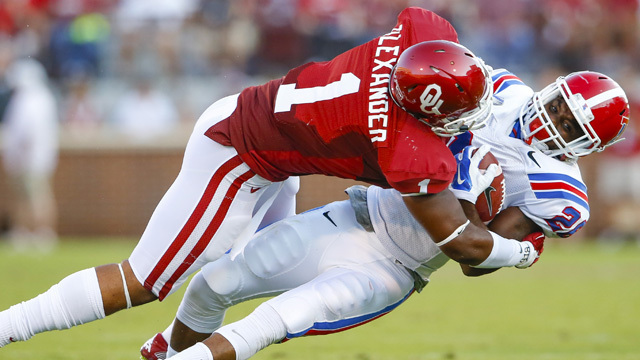 OU (1-0) was up 21-0 and was well on its way to cruising to an opening night victory. Shepard caught a 16-yard touchdown and had four receptions for 49 yards. There were a lot of questions about what that team was, especially at running back. Five-star running back Joe Mixon was suspended for the season two weeks ago following an altercation with an OU student after his 18th birthday party. Won’t know what OU has with Mixon until 2015, but the three-headed monster of freshman Samaje Perine and sophomores Alex Ross and Keith Ford fared just fine. The three combined for 164 rushing yards, 96 passing yards, 80 return yards and five rushing touchdowns. OU’s mentality has always been it’s the next man up. No Shannon. No Mayfield. No Green-Beckham. No Mixon. No problem. No excuses and back to business for the Sooners.